Who are we at Cyberhenge? Cyberhenge was formed in 1997 to help businesses take full advantage of the Internet. Our founders combined decades of business management and computer systems experience. As the Internet has levelled the business playing field, for the first time nearly every business can afford global information distribution and management, easy customer contact, enhanced marketing, and streamlined data processes. Cyberhenge specifically serves the internet needs of small businesses, particularly individuals and partnerships. We have developed a customer base largely involved in fine arts, designer crafts, and specialized antiques and collectibles. Our clients are discerning individuals seeking a distinctive internet presence to showcase fine products. We also provide seamless web-based solutions for inventory and customer database management. Cyberhenge delivers these new opportunities to you, helping you turn the Internet's potential into profits with custom web site design and hosting, systems development and management, Internet business consulting, and systems consulting. As consultants, we assess your individual business needs, and identify solutions. As service providers, we create and implement efficient systems for your business to sell, purchase, gather sales data, market your company, enhance your branding, and more. Cyberhenge's Founder and Principal, has used new technology to enhance start-ups and Fortune 500 companies alike. With an MBA from Columbia and over twenty years of experience in financial control, corporate systems, and operations, Mr. Piuck excels in assessing business computing needs. He has been an entrepreneur and consultant to businesses that include General Motors and Eastman Kodak. He also spent years as a Business Manager at a defense contractor, where he directed budgets in excess of $60 million and was active in the implementation of a number of computing systems. Mr. Piuck has assembled a team of consultants, including programming and graphic design specialists, to serve the unique needs of all Cyberhenge clients. Contacts developed during many years in the field of computer systems are available to provide the specific services needed to promote your business with an online presence and to meet your database requirements. We are called Cyberhenge in honor of Stonehenge. To this day it is a mystery how people used the technology of 4,000 years ago to craft Stonehenge so well that it still awes visitors. Built with huge stones that were somehow carried hundreds of miles, Stonehenge is a wonder of its age. Similarly, at Cyberhenge, we see the Internet as a wonder of the modern age, and hope to play a role in expanding this great creation so it will stand for generations to come. 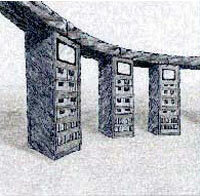 Stonehenge was the cutting-edge technology of 2000 BC. Cyberhenge bringe cutting-edge technology into the 21st century.